Is there a better alternative to PingDoctor? Is PingDoctor really the best app in Network category? Will PingDoctor work good on macOS 10.13.4? PingDoctor needs a review. Be the first to review this app and get the discussion started! PingDoctor needs a rating. Be the first to rate this app and get the discussion started! 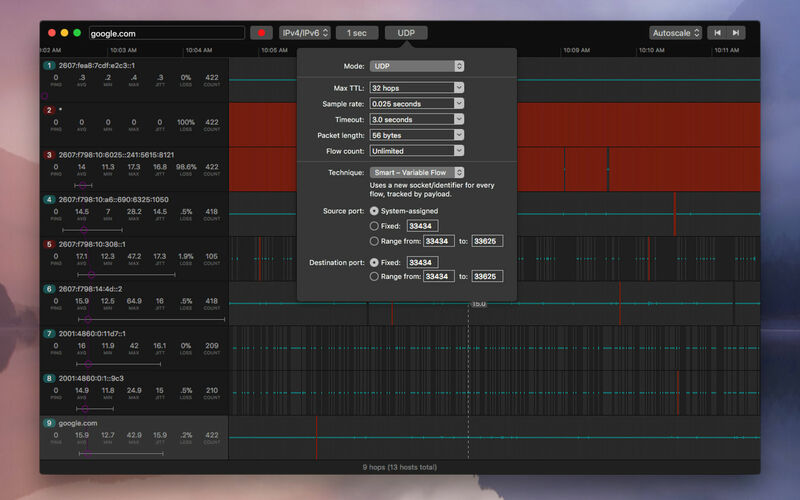 PingDoctor is an advanced network route analyzer and ping sampling utility built for high performance and deep insight. 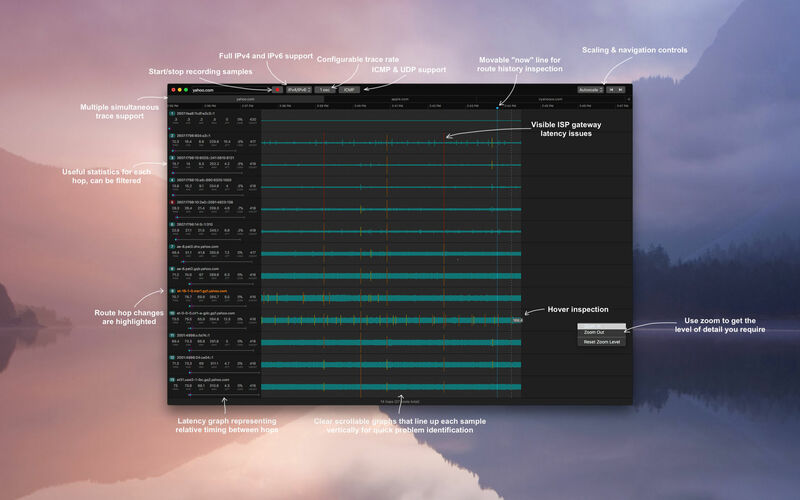 Use PingDoctor to record samples for each hop on the way to any Internet or network destination and collect detailed analytics to help you locate any issues along that route, such as packet loss, latency (lag), jitter or mis-routing. Highly-detailed sample graphs can be navigated with ease and are recorded in a linear-stacked fashion which allows you to quickly gain insight into any problem-causing hosts along the way to your destination. 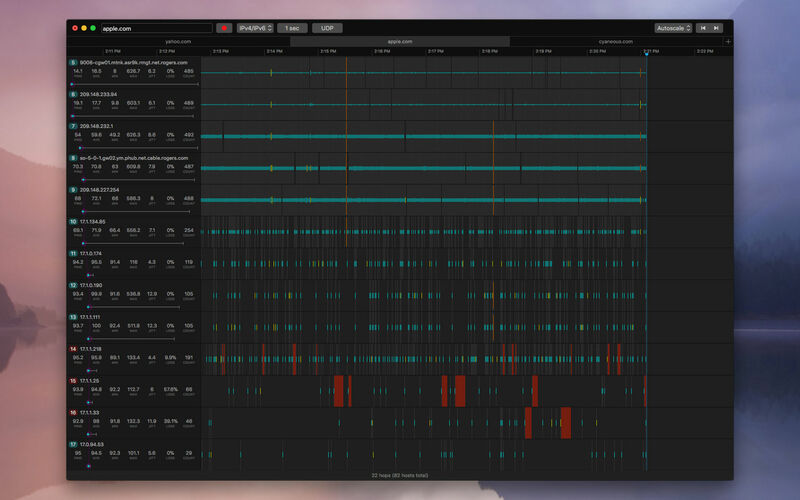 Latency and loss are highlighted for quick identification and network jitter is recorded at each sample. 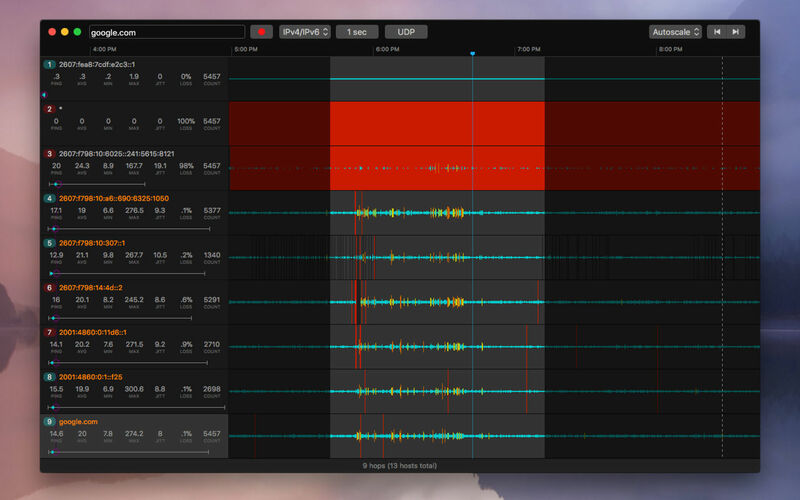 Of course, vitals such as average, minimum and maximum latency are also recorded. The afore-mentioned information can also be calculated based on any portion of a recoded trace session. PingDoctor is an indispensable addition to your professional network/route troubleshooting toolkit. PingDoctor is able to diagnose using both ICMP and UDP methods, in various configurations. ICMP support is commonly used for general network troubleshooting, route testing and performance monitoring. It requires no configuration and is able to provide a good general health overview of a route to a destination. UDP support is often used for troubleshooting real-time communications such as voice, video communications, online gaming or video streaming. 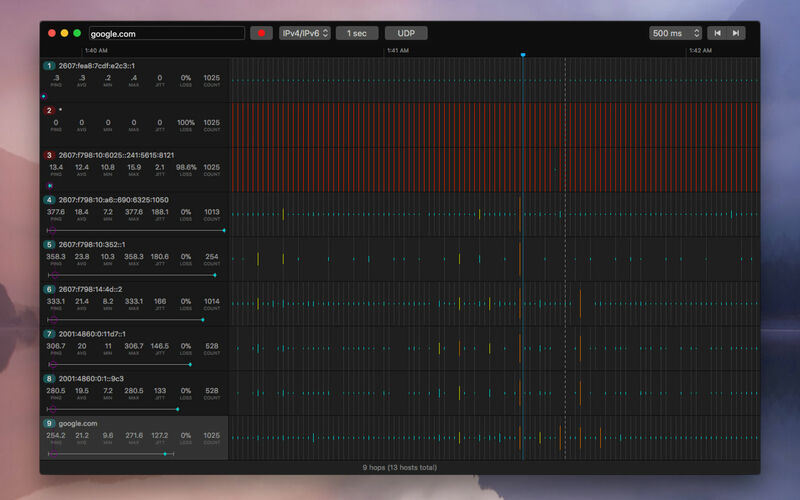 PingDoctor will record latencies, loss and dynamic route change history and allow you to analyze the results at various scales. PingDoctor is able to reproduce/track routes more accurately than third-party traceroute utilities thanks to our Smart Tracking feature, which is able to simulate various network communication patterns that affect the chosen network route (such as streaming, signaling, etc.). Smart Tracking also allows more flexibility in what ports are used on both ends of the route test, which means it is far easier to reproduce any necessary network conditions for a test. Standard unix-like tracking is, of course, also supported for both the source and destination ports. PingDoctor supports saving and loading collected samples for review at any time and tracing more than one destination at a time. Traces can be performed at various rates, intervals and the payload size is adjustable for both ICMP and UDP traces.